You can now donate online. Click here! Christian Family Radio is a listener supported ministry. What this means is that nearly all the financial needs of this ministry are supplied by many generous listeners. Since the start of Christian Family Radio, we have made it a policy that we do not accept compensation from program providers. This has enabled us to be very careful in choosing programming that meets our biblically based standards, and gives us the freedom to cancel any program that strays from these standards. Christian Family Radio is also non-commercial, meaning that we do not air commercials in order to pay the cost of this ministry. At the same time, we are able to feature businesses that sponsor programming on this station. Sponsorships are exactly that, we are simply giving out factual information about a business and are not allowed to “advertise” such things as a special sale or pricing. In the last couple of years, we have added “Day Sponsorships” as another means of supporting this ministry. A Day Sponsorship is exactly that; a listener or business pays for the cost of operating Christian Family Radio for one day. With our very low cost of operation, this is only $290 at this time. We then run a special announcement for the Day Sponsor over Christian Family Radio that is played approximately 15-20 times during that day. This announcement may feature a special loved one, either living or as a memorial to their life, but could also feature a business, someone that made an impact on your life, or even another ministry that takes the same doctrinal stand as Christian Family Radio. Absolutely essential to the operation of this station are the prayers of God’s people. Please be sure to keep Christian Family Radio in your prayers, and with the Lord’s help we will be here broadcasting the Gospel until the return of Jesus. 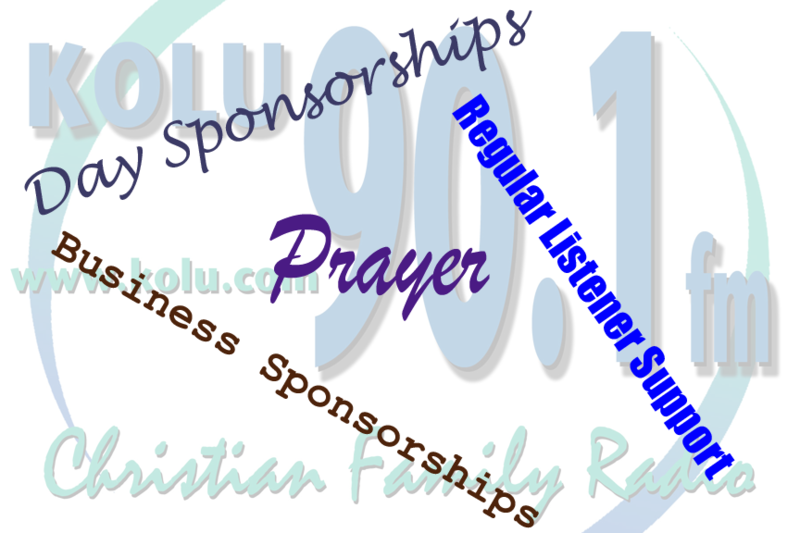 Thank you for your prayers and financial support of Christian Family Radio!